"THERE'S never been a crime committed that hasn't been capable of being solved by logical deduction—not even an illogical murder." Constable Martin nodded dutifully. Sergeant Habbard had a habit of lecturing his subordinates in and out of season. "Where is Wye Street, please, constable?" "First to right; third on right," Martin answered promptly. Sergeant Habbard swung round and stared after the constable's interlocutor. They were standing at the corner of Pitt and Hunter Streets. "Notice that man, Martin?" snapped the sergeant. "Not particularly." The constable stared down the street. "Just an ordinary sort of chap, I thought." "Did you? Should use your eyes, young fellow. Why, he has a pure white face." "Pure white face!" Martin turned to face his superior officer. "Well...never thought him a coloured man." "Don't be a fool!" Habbard was angry. "You're white; so am I—but we're not white like him. He's got a face like a sheet of paper—dead white, y'know. Not an ounce of blood behind it. Well, s'long. Must get on." 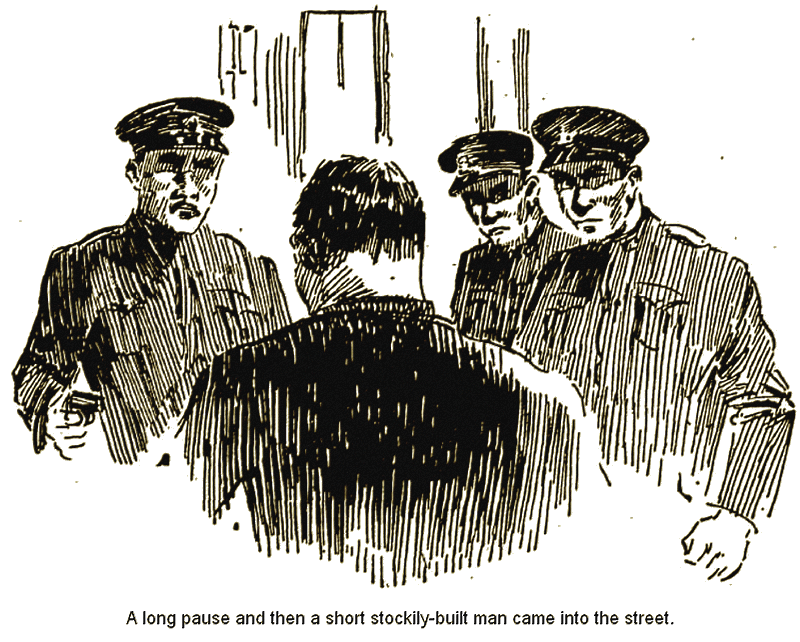 Sergeant Habbard strolled smartly up the street to meet the constable on the next point. Once he turned, to see Martin continue his beat up Pitt Street. He looked at his watch. It wanted five minutes to ten o'clock. At the corner of Castlereagh and King Streets he found Constable Bliss awaiting him. He received the constable's report, and for some minutes they stood talking. Habbard noticed that the streets were strangely empty. Yet in a bare half-hour the theatres would empty on to them their excited throngs. A clock chimed the quarters, then struck the hour. Habbard went on talking. Again he had launched on his favourite topic, of logical deduction applied to criminal detection. Suddenly the shrill call of a police whistle rent the still air. The sergeant swung round and raced to the end of Wye Street. Halfway down he could see a man standing, his hand to his face. Again the shrill call sounded. "What's the matter, Martin?" Habbard asked as he raced down to where the constable stood, Bliss following close. "What's this? Dead?" He bent over the body of a man huddled In a recessed shop doorway. By the light of Martin's electric torch he saw the face. "Why...why, Whiteface!" He looked up at the constable. "Recognise him, Martin?" "Don't think; that's him—the man who asked direction of you at the corner of Hunter Street. Whiteface! I'd know him any where." "'Course he is. But how was he done in? Bliss, telephone ambulance and headquarters. It's their Job, not ours; still..."
A careful examination of the body, as it lay, and then Habbard went to straighten it. Immediately he stood up and looked at his hands. "Why...why, Whiteface! Recognise him, Martin?" "Stabbed in the back!" He wiped his hands free from the blood. "And he died only a little while ago. How long have you been here, Martin?" "'Twas just after ten when I got up here," Martin meditated. "Took me five minutes to reach foot of Wye Street from where we parted, sergeant. Y'know, we stood a couple of minutes, talking, after he spoke to us. That means, that for seven minutes he was out of my sight. Say he walked here quicker than I. That makes-"
"-Him killed five minutes after he left us," Habbard completed. "You were about three minutes behind him coming here. See anyone? Pass anyone?" "See anyone in this street?" "No. Didn't see anyone after you left me, sergeant, until I saw him again." "Yet he must have been close handy!" Habbard cocked his head. He turned and gazed at each end of the street. "Couldn't have gone down to Pitt Street. You'd have seen him if he had. Must have gone up to Castlereagh Street. Humph! Not time to reach that corner. Might..."
He stared speculatively about him. Wye Street was ill-lighted and filled with dark corners and little alleys between the houses. The sidewalks were useless for pedestrians, being barely a couple of feet wide. The roadway was narrow—at no part could two vehicles have passed. Habbard was perplexed. The affair defied his reiterated dictum that all crimes were solvable by pure logic. There was no points to reason here—Constable Martin had been on the spot within three minutes of the murder, and had seen nothing. "The perfect murder!" the sergeant muttered. "Not a clue. Martin comes in one end of the street; Bliss arid I, the other. There is no one in sight. Yet, one of us should have seen the man who stuck the knife in Whiteface's back." He had not even the knife to theorise on. The murderer had taken that with him, Habbard frowned. There must be a clue about. Whiteface had walked from Hunter Street to Wye Street within five minutes. That was quick walking. To do better he would have had to run. The sergeant remembered the man had been walking smartly—not too fast—when he watched him out of sight. Whiteface had arrived at the Pitt Street end of Wye Street a couple of minutes before Constable Martin. It would have taken him another minute to walk up to the shop-door. Martin had been out of sight of him for a bare couple of minutes. But—had he? Whiteface had had three blocks to travel when he turned into Pitt Street. Surely the constable must have seen him, ahead, in that brightly-lighted thoroughfare. The sergeant turned to the constable. "See anyone between turning into Pitt Street and Wye Street corner, Martin?" "Never noticed anyone, sergeant. Y'know, if a man keeps along the shops, close, he's difficult to see at night, even when the streets are empty." Habbard nodded. He was baffled. He looked at his watch. It was twenty past ten. In another ten minutes the men from the Criminal Investigation Branch would arrive and take over the inquiry. If only he could hand over an open and shut case, proving his pet theory. He turned to the shop before which Whiteface lay. The one small window contained oriental rugs and ornaments He tried the door. It was barred fast. He stepped back into the road, and looked up. The one storey above was in darkness. Who had placed Whiteface in that shop doorway? The man could not have crawled there after he had been stabbed. The position in which he lay precluded the theory that he had been standing in the doorway when struck. Someone had placed him there. Turning from the doorway, Habbard threw the light of his torch on the roadway. There were blood marks. He traced them a few feet. Then they ceased. "Was that man wearing his overcoat when he spoke to us, Martin?" Habbard asked abruptly. "No, sergeant. Carrying it over his arm." He went back to Whiteface and searched the pockets, arranging the miscellaneous collection of articles he found on the curb. There was nothing of a suspicious character. He rolled the body over, and turned up the overcoat and jacket. Something bulky was in the hip-pocket. He pulled out a large clasp-knife. "Good enough! One more point and..." He looked at his watch. "Two minutes to go." The constables shook their heads. Habbard smiled grimly. "Keep on telling you to use your brains—but you won't. Here's a murder committed, almost under your eyes—and you don't see more than a dead body. Work it out! It's plain enough." "The knife didn't pierce the overcoat, sergeant," Bliss ventured. "Why?" He waited; then continued. "Because the blow was struck while the murderer helped Whiteface into his overcoat. That's the only answer to the wound in the back and the overcoat being on. Now, that knife I found in his hip-pocket?" Both constables showed faces of blank ignorance. Habbard felt exasperated. He had spent time and breath in trying to teach these men to think logically. Here was the result. "Plain as your faces, and they're plain enough to frighten crows." He spoke angrily. "Whiteface speaks to Martin and I at the corner of George and Hunter Streets. He inquires direction to Wye Street. Martin tells him. A couple of minutes later and Martin leaves me. He comes up Pitt Street, to here. I go up to Castlereagh Street to meet Bliss. What was the time when we met, Bliss?" "A couple of minutes to ten, sergeant. I looked at my watch as you came up. You were due at ten o'clock." "Good! Martin follows Whiteface along Pitt Street, yet never caught sight of him. He says he took five minutes to do the journey. As he arrived at Wye Street the clock struck ten. Right, Martin?" 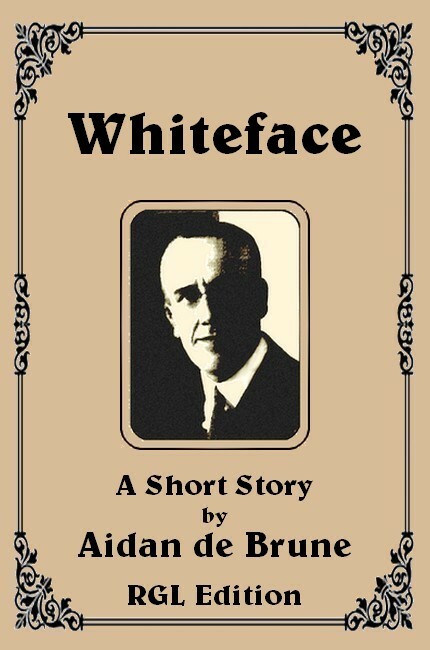 "Taking Martin's times, he reached Wye Street not more than three minutes after Whiteface. Now, Whiteface walked up Wye Street. That would occupy a minute. Therefore Martin was at the foot of Wye Street two minutes after Whiteface arrived here—and met his murderer. Get that?" The men nodded. They were interested. "Well, now," Habbard spoke with Increasing confidence. "Well take it the two men exchanged a few words. The murderer helped Whiteface into his overcoat—and struck the fatal blow. That wasn't done in a few seconds. Bay a couple of minutes. Then Martin was at the foot of this street as the blow was struck. What then?" Again the constables remained silent. Constable Martin's face had blanched suddenly. "Then the murderer thrust Whiteface into this doorway. That occupied more time. He had then to escape. To go down to Pitt Street would have run him into Martin's arms. To go up to Castlereagh Street—well, Bliss or I would have seen him, for we were facing this way. Remember, the three minutes Martin estimates between Whiteface and he arriving at the Pitt-Wye Streets corner has more than been absorbed. The theory's impossible—unless Martin slipped up on his timing—or was here..." The sergeant's words trailed into silence. "What?" Martin spoke suddenly, huskily; his face was working strangely. "To see ourselves as others see us," Habbard misquoted. "We men can't see ourselves, night or day, for we don't carry mirrors, like women. Martin saw no one—not even himself..." The sergeant's voice changed. "Got that sailor's clasp-knife on you, Martin?" The man felt in his hip-pocket. "No. Must have left it at home." "And a sailor's clasp-knife would just fit that wound. 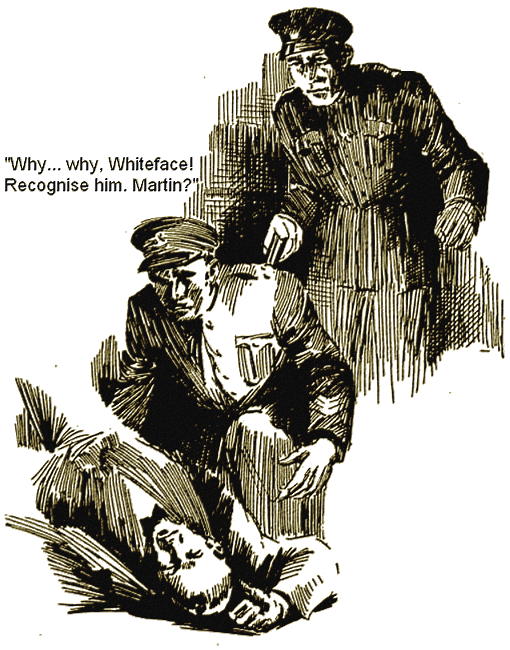 Met Whiteface before, Martin?" "Know how he got that strange pallor? No? Well, look at this." Habbard opened his hand and showed a small white packet. "That lay under his hand. Know what it is? Cocaine, heroin, or some beastly drug. That's what Whiteface stood for. Drug carrier or dope addict." He was silent a moment. "Looks mighty awkward, doesn't it?" "Are you accusing me, sergeant?" Martin stepped, forward, his eyes blazing with anger, his fists clenched, "I'll tell you..."
"Ah! Here they are at last!" the sergeant Interrupted. A motor-car had turned into Wye Street and stopped. Four men alighted and walked down to the group around the gruesome figure, half in the doorway. "Evening, sergeant!" The man who led, spoke abruptly. "Murder, eh? Any clues about?" "Wait a minute, Manfred." Habbard caught the detective by the arm. He turned to Martin. "You asked me if I accused you of the murder. Can you deny that your own statements, every clue here, points to you alone—except one. You'd have mixed those times better." He walked a few steps up the street and faced a small dark alley. His hand came from behind him, pointing into the alley. "Come out of there—or I'll shoot!" Habbard spoke commandingly. A long pause, and then a short, stockily built man came slowly into the street. In his hand he carried an open clasp-knife. "There's your answer, Martin. Every clue pointed at you, but logical deduction proved your defence. I don't think you fellows will laugh at me again. As I said before, there's never a crime committed but what isn't capable of being solved by logical deduction—not even an illogical murder, and Whiteface's death proves that."